WASHINGTON, DC, February 9, 2011 (ENS) – The Pacific walrus warrants protection under the Endangered Species Act, but an official rulemaking to propose that protection is currently precluded by the need to address other higher priority species, the U.S. Fish and Wildlife Service determined Tuesday. As a result, the Pacific walrus, Odobenus rosmarus divergens, will be added to the agency’s list of candidates for Endangered Species Act protection and its future status will be reviewed annually. Any future proposal to add the Pacific walrus to the federal list of threatened and endangered species will be subject to public review and comment. The Service’s determination, known as a 12-month finding, found that the walrus is primarily threatened by the loss of sea ice in its arctic habitat due to climate change. While candidate species do not receive protection under the Endangered Species Act, Pacific walrus in the United States are currently protected by the Marine Mammal Protection Act of 1972. Haskett said these protections are similar to those under the Endangered Species Act and include prohibitions on the harvest, import, export, and interstate commerce of the Pacific walrus or walrus products. But the Center for Biological Diversity is not persuaded that these protections are sufficient to save the walrus from extinction. The nonprofit organization petitioned the Service in February 2008 to list the Pacific walrus as threatened or endangered under the Endangered Species Act and to designate critical habitat for the animals. Wolf points out that the Service’s decision goes against the recommendation of the Marine Mammal Commission, an independent federal scientific advisory body, which endorsed listing the Pacific walrus as a threatened species. The Pacific walrus is found throughout the continental shelf waters of the Bering and Chukchi seas and occasionally in the East Siberian Sea and the Beaufort Sea. 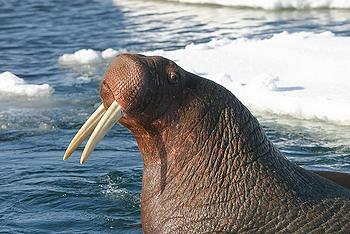 The precise number of the Pacific walrus is unknown. The last joint U.S./Russian survey, conducted in 2006 using thermal imaging systems and satellite transmitters, estimated walrus numbers at 129,000. This is considered a minimum estimate, since weather conditions forced an early end to the survey and not much of the southwest Bering Sea was completed. Pacific walrus use floating sea ice as a substrate for birthing and nursing calves, resting, isolation from predators and for passive transport to new feeding areas. The Service has concluded that loss of sea ice – with the resulting changes to walrus distribution and life history patterns this loss entails – will lead to a population decline and is a threat to Pacific walrus in the foreseeable future. Bob Irvin, senior vice president of conservation programs for Defenders of Wildlife, said the Pacific walrus faces a difficult future.